How weird is the weather where you are? It’s kind of weird here in the Pacific Northwest. Punksatony Phil said it’s six more weeks of Winter, but the flowers are blooming, there are a couple of Cherry Blossom trees coming out showing their beautiful colors. It’s also sixty degrees and sunny. So I see Spring is coming sooner than six weeks, but I am not Phil. He has a very good record, so maybe there will a final hooray from Winter, and we just don’t see it coming. 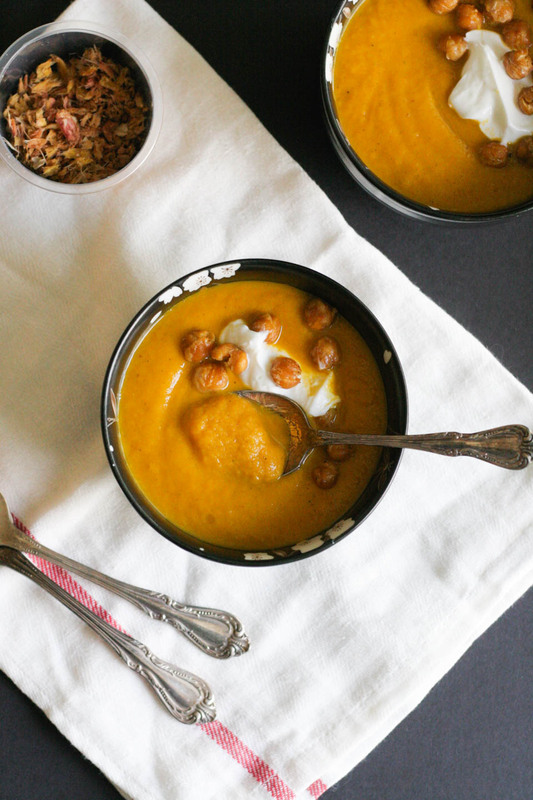 Roasted Carrot Soup with Ginger Chickpeas is the way to go! We all need a good warming soup though. Sixty degrees here, seventy in California, and below zero on the East Coast. We all need a bit of carrot soup with extra crispy chickpeas, it can help us all feel comforted, full, and good about what we ate. Bright carrot soup is so pretty and when I make soups like this, I want them to fill me up for dinner. So I add the chickpeas for protein and they are very filling. Plus the yogurt is creamy, healthier than cream, more protein, and tangy goodness. 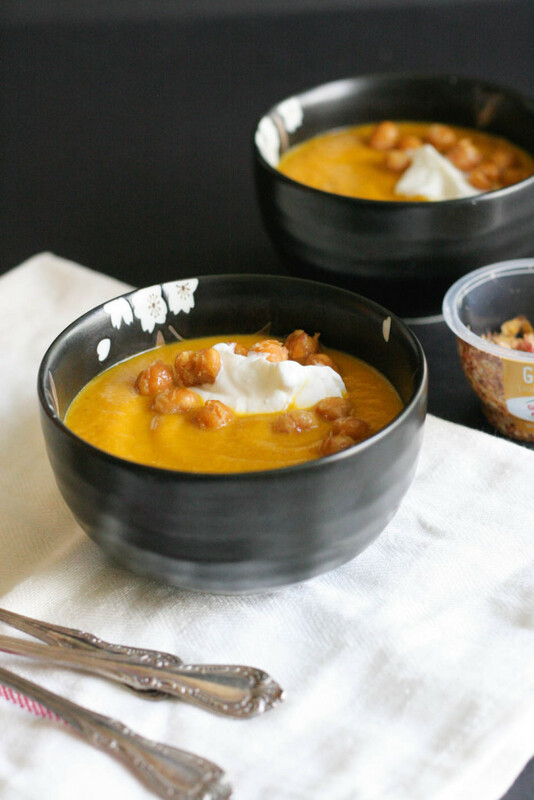 So this Roasted Carrot Soup with Ginger Chickpeas is good for a whole meal, hearty lunch, and awaiting Spring. How you would normally find ginger in the soup, I wanted to spice up the chickpeas instead. I roasted them with ginger and made them awesome! This lightly dried herb from Gourmet Garden is super fresh, because of how lightly dried it is. It is pungent, and easy to use in everyday cooking. I keep a jar of it in the freezer for easy use all of the time. It is also very good for us, so add more to the recipe if you like! 1. 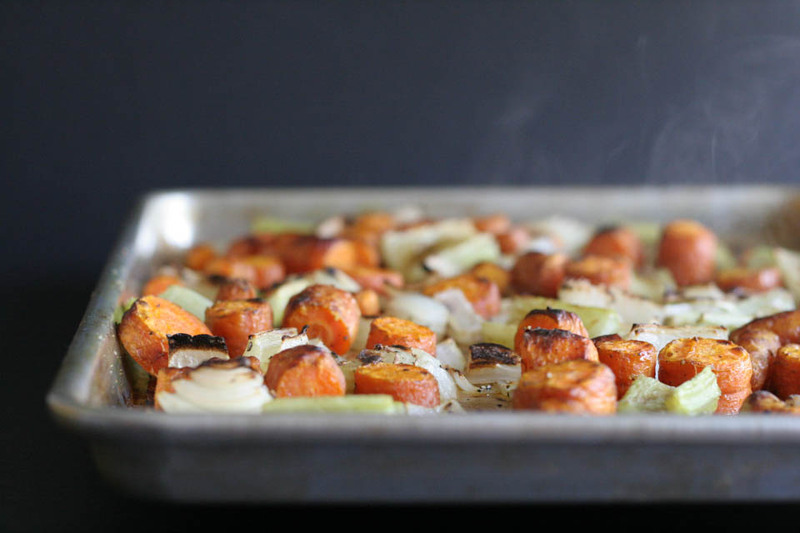 Place carrots, onions, and celery on a parchment lined baking sheet. Drizzle with 2 tablespoons olive oil, 1/2 teaspoon fine sea salt, and 1/4 teaspoon fresh cracked black pepper. Toss to combine using hands, or tongs. Place in oven for 25 minutes. 2. While vegetables are roasting, toss chickpeas in 1 tablespoon olive oil, ginger, and 1/8 teaspoon fine sea salt in a small bowl. Set aside. 3. Remove vegetables from oven and place in blender with 2 1/2 cup stock/water. Blend until smooth. Taste for seasoning. Add more liquid, salt and pepper to taste if needed. 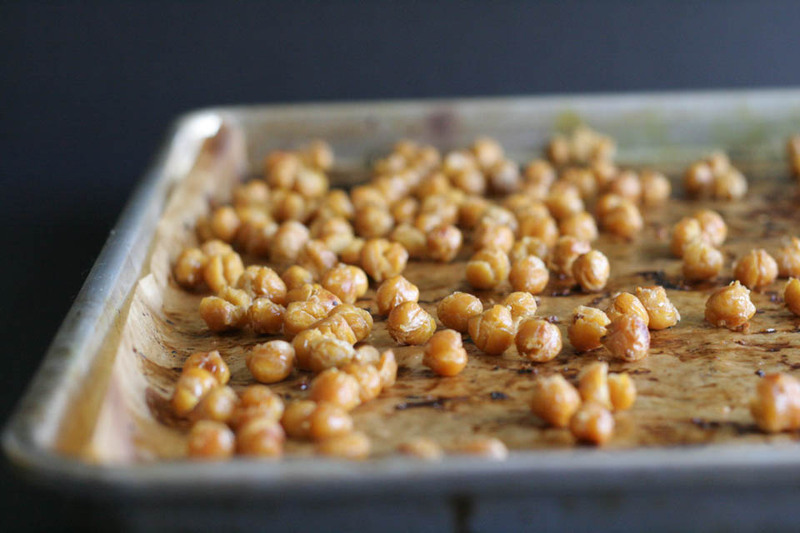 Place chickpeas on the same sheet pan where the vegetables were, place in oven for 20 minutes. Remove and allow to cool for 5 minutes before serving them. 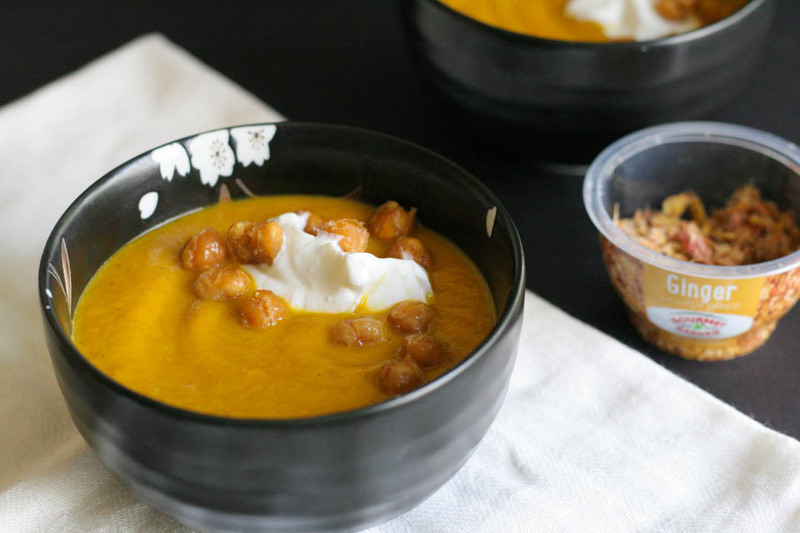 Serve soup warm with toasted chickpeas, and a dollop of yogurt. Place leftovers in an airtight container for up to 5 days. Keep chickpeas in a separate container. Other awesome carrot recipes from around the web! I love this! Looks like a sweet, creamy, flavorful soup for those cold fall nights. Just beautiful! I love roasting vegetables to bring out loads of great flavors, and it’s such a delicious idea to turn perfectly roasted veggies into a hearty, nutritious soup! The wonderful additions of chickpeas and yogurt for protein really do turn it into an easy, comforting meal! Yes yes yes! My thoughts exactly when I made this soup :), thank you! Mmmm wow I’m loving those ginger chickpeas! What a wonderful garnish and flavor complement to this gorgeous carrot soup. They totally made the soup! Thank you so much. Ginger is always a “must have” in my spice cabinet. This soup looks and sounds delicious! I love ginger! I always have fresh, dried and an “emergency” tube of Gourmet Gardens in the fridge. I also have lemon grass, which is so handy for asian dishes! Beautiful pics too Fabiola! Me too! Thank you so much, Cynthia, so sweet! Oh awesome!! Thank you so much :). We love Gourmet Garden, and use it all the time! Your soup look incredible! 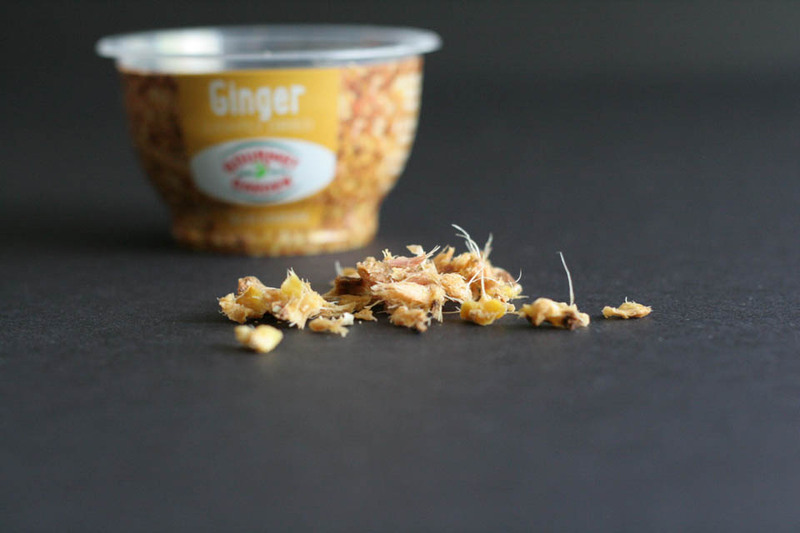 One of my new year’s resolutions is to add more fresh ginger to my life in 2015. I’ve been adding slices to my evening honey lemon tea as a start. I suspect I’ll be using it in smoothies when it’s warm enough to skip the tea. I still use the GG ginger paste, though, so I don’t need to fuss with grating the root. I’ve not seen the lightly dried–thanks! This soup looks lovely, and great for our snowy weather! That is an awesome addition to your new year, it is so good for us right?!! I do the same, and the lightly dried one is so good. Thank you so much. Good luck on your new years resolution! Oh, I have been wanting to try that lightly dried ginger. This soup looks awesome! You totally should try it, it’s so great! Thank you. The temperature keeps going from hot to cold. This soup would be perfect for any type of day. Luv how you used the GG ginger. What a great product to have on hand. Great ingredients in your carrot soup – it’s always a good time for soup in my book! I am in love with carrot soup – the ginger is amazing. And I love Gourmet Garden so much! Thank you, Dorothy! So amazing. With it being about 3 degrees here, a good soup is definitely needed. I’ll have to try this out. It was 75 here in Tampa today ….But I would certainly eat a big ol’ pot of this soup! Oh nice! It’s always a good time for soup right?!! Wow this looks good! Warm and comforting. Just the thing for winter! Thanks for the recipe. Can’t wait to try it.